The most basic cable package from Charter (Spectrum?) costs me more than $70 per month, and that's without any equipment other than a single cable card. It's very clear why people have been cutting the cord with cable TV companies. But, what options exist? Do the alternatives actually cost less? Are the alternatives as good? I've been trying to figure that out for a few months now, and the results? It depends. The idea of cord cutting isn't new. For years, people have been severing their ties with cable companies in order to save money. The ever-persistent question is this: how do the options compare? Real Time or On Demand? When replacing cable TV, there are two main types of media in question. Services like Netflix, Amazon Prime and Hulu are great, but they don't provide live television. In fact, depending on the show and service, you might need to wait until the next day or even the end of a season before your desired shows are available. You usually get the advantage of no commercials, but the waiting often is unbearable if you're into television shows that end with cliffhangers. It is interesting though, now that Netflix and Amazon have been so successful with their streaming services, they're beginning to get their own exclusive shows. This means that not only are the shows not delayed, but they're also actually not available at all via cable TV! Admittedly that phenomenon is fairly new (only the last few years), but it makes the case for streaming far stronger. Why pay $70 per month and still not get to watch Jessica Jones? Also, many individual stations are starting to offer their own streaming options, so the days of paying for cable so you can see a particular HBO show are over. Broadcast networks are starting to offer streaming options too, so if you're just looking for the ability to watch particular television shows, even paying for multiple online accounts is cheaper than paying for cable—usually. Some of the biggest hurdles for cord-cutters are cable-only channels. I have a relative who watches only shows on the History Channel. And my mother-in-law couldn't live without watching movies on the Hallmark Channel. And everyone I know in real life is addicted to HGTV and its tiny house program. Those channels aren't big enough to support a full streaming platform (or are owned by actual cable companies, so they won't offer a non-cable alternative). So what's a cord-cutter to do? Until recently, not much. Now, however, there are three really good options for streaming cable television stations, and one is almost really good. Those options aren't exactly cheap, and they're mostly US-only, but they're far less expensive than cable TV. The three options each have their quirks, but any of them are worth looking into if you have reliable internet speeds that aren't dependent on cable TV bundling. Currently, the three main options are Sling TV, PlayStation Vue and DirecTV Now. Sling TV has been around the longest and is owned by Blockbuster (yes, that Blockbuster! ), who in turn is a subsidiary of Dish Network. It has a large lineup of cable stations and several tiers of options that include packages like premium cable channels. Depending on promotions and where you live, the packages range from $20–$40 per month. If you live in a big city, you also might get local broadcast stations (NBC, ABC, CBS, PBS, FOX), but for most of the country, you get those channels only "on demand", which means recordings of popular shows the next day. Figure 1. Sling TV has been around a long time, but the lack of DVR and video glitches make it less than stellar in my experience. 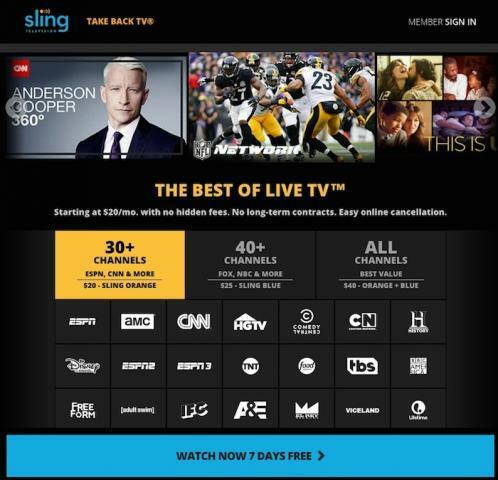 There's a free trial with Sling TV, so it's worth checking out. Just be sure to cancel it before your credit card auto-renews at the end of the trial, unless you decide to keep it. Also, because it's been around for a long time, Sling TV has apps on multiple platforms. Xbox users can install Sling TV, along with Android TV and Roku users. Like most streaming services, Roku does a great job of staying vendor-neutral, which means it usually can provide services regardless of who is providing them. Figure 2. 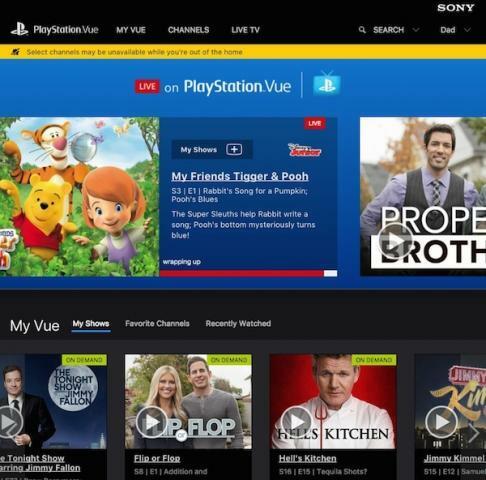 PlayStation Vue is remarkable, until it's not. The video quality is amazing, and the DVR is superb. The geolocation frustrations along with PS4 console problems make it difficult to love. Although the slightly higher price seems frustrating, the technology included might make up for it. Not only can you stream to five devices simultaneously, but it also provides "Cloud DVR", which automatically stores recorded content for you. All you need to do is mark a program as a favorite, and all episodes are saved for 30 days. It's not possible to schedule a timed event, but the DVR feature is extremely nice, and it provides a far better experience than the live-only Sling TV. DirecTV Now is the new kid on the block when it comes to cable TV streaming. The packages are similar to the other services I mentioned, with some initial low-priced options available to entice users away. (Note: with all these services being contract-free, the potential for moving in order to save a few bucks is very legitimate!) DirecTV Now has similar limitations regarding live broadcast stations (that is, at the time of this writing there aren't any available), but DirecTV Now has the additional limitation that even on-demand content from CBS isn't available. The kerfuffle that DirecTV and CBS have been having extends to the streaming service as well. Figure 3. DirecTV Now is the new kid on the block. The $35/month is a trial cost and likely will increase before this article is published. I haven't personally used the DirecTV Now service, because none of my devices currently are supported. (Apple TV is its main device, and you can get one free if you pre-pay for three months of service.) I have friends who've used it though, and they say the quality is very good. Like Sling TV, however, it doesn't currently have any DVR capability. Since DirecTV Now is new, it's not fair to criticize its lack of hardware support yet. Roku streaming is slated for Q1 2017, and it's possible other non-competitors will get apps as well. As is usually the case, Roku likely will be one of the premiere ways to watch streaming cable TV service, because its compatibility will allow for service-hopping without hardware reinvestment. USTVnow is a service designed for US citizens living outside the US and, therefore, unable to get US television. 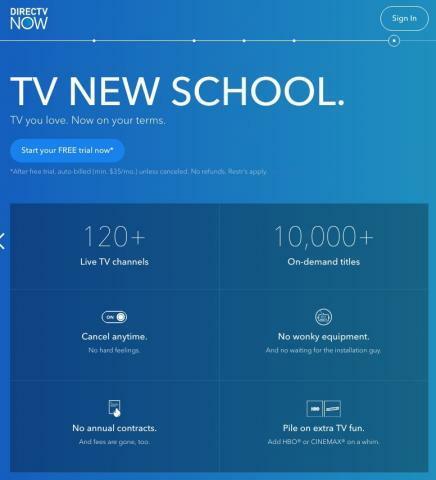 It's a streaming service that provides live network channels (ABC, CBS, NBC, PBS, FOX) for free, and for a monthly fee, it adds a few cable channels (28 total) and HD streaming as well. 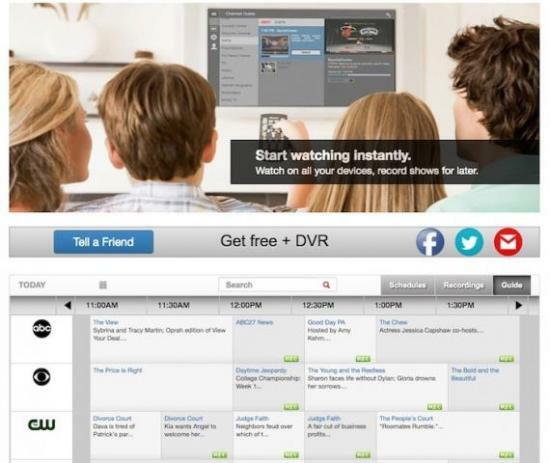 There is also some DVR service included with the premium packages. Any time I've tried to use USTVnow inside the US, it's worked perfectly, so there aren't any apparent geographical restrictions. Honestly, on paper, it's the best thing going. Figure 4. I want to love USTVnow, and perhaps now that there is a paid service, the reliability will improve. I just hope it's able to keep providing live broadcast channels in the US. Unfortunately, the times I've used USTVnow, I've had lots of glitches. Usually it's during busy times (Super Bowl party, for instance) that the service glitches, but since those are the times I want it to work the most, it's been a frustrating service. The pricing is competitive, however, especially since the SD free tier is really free and provides live broadcast stations. As with most services, Roku seems to be the best way, apart from a browser, to consume USTVnow. I want to love USTVnow. I have no idea how it's able to provide service in the US when the other options struggle to provide broadcast stations. Hopefully, it's not a loophole that will be closed, because for some folks, it's the only way to get broadcast channels at all, even if they do live in the US. Yes, obviously using an antenna is a great way to get local television. In fact, you can head over to http://antennaweb.org and see what channels are available in your area and what sort of antenna you'll need. 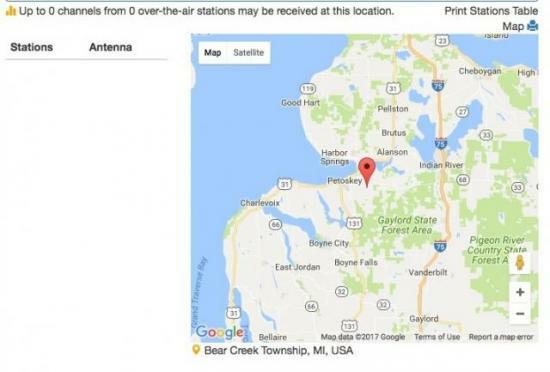 The site even will tell you what direction to point your antenna for the best signal. If you're just looking for some old-fashioned television, an antenna is often a good option. Plus, apart from the hardware, it's totally free. Figure 5. "Up to 0 channels" is a sad thing to see; I hope your location is better. The problem is, even though I live in a (small) city, I get exactly zero channels from my location. That is due to geography, because I live on the side of a hill, but nonetheless, I can't get any channels using even a rooftop antenna. Even if you can, however, it's worth considering whether that sort of system is acceptable for you. I don't want to switch my input source on the television every time I want to watch TV. And TiVo has spoiled me; I want to pause live TV. It's possible to get something like an HD Homerun device from Silicon Dust and convert your antenna signal into a digital stream, but integrating that into your entertainment system is often challenging. Plus, I had so much frustration with my HD Homerun setup in our last house that I opted to just buy a cable TV subscription. So OTA (over the air) channels are worth checking out, and for some people, they are more than enough. For me, however, even if I could get a good signal, I want more. If you live in a big city and can get local channels via services like Sling TV or PlayStation Vue, things like watching the Thanksgiving Day parade are possible. For me, the only way I can watch live events is with the not-always-reliable USTVnow. And even those channels aren't local, so I can't ever watch the local news. My big issue used to be how to watch the Olympics, but thankfully, many streaming options are available now. Still, watching the Thanksgiving Day parade is something I've done my whole life, and without some way to see local channels, all the cable channels in the world don't help. Because I have thousands of dollars invested in my TiVo infrastructure (lifetime Roamio subscription and four TiVo Minis), I'm still paying for the lowest tier of cable TV. I find that we almost never switch over to the TiVo, however, so in the next few months, I might bite the bullet and cancel cable TV altogether. For most folks, services like Sling TV, PlayStation Vue and DirecTV Now provide more than enough service at a fraction of the cost. So if you live in a big city or can live without live broadcast channels, I urge you to give them a try. Each is available with a free trial, and if you sort through the various pros and cons, coming up with a satisfactory service is pretty easy. If you've cut the cord (many of you I've spoken with already have done so), I'd love to hear about your specific solution. Do you just switch sources on your TV and use rabbit ears? Do you strictly Netflix and chill? Have you sold your television and reverted to books? (I'm often tempted.) Please let me know. I'd love to follow up with some alternatives for folks like myself who are still struggling to cut the cord.